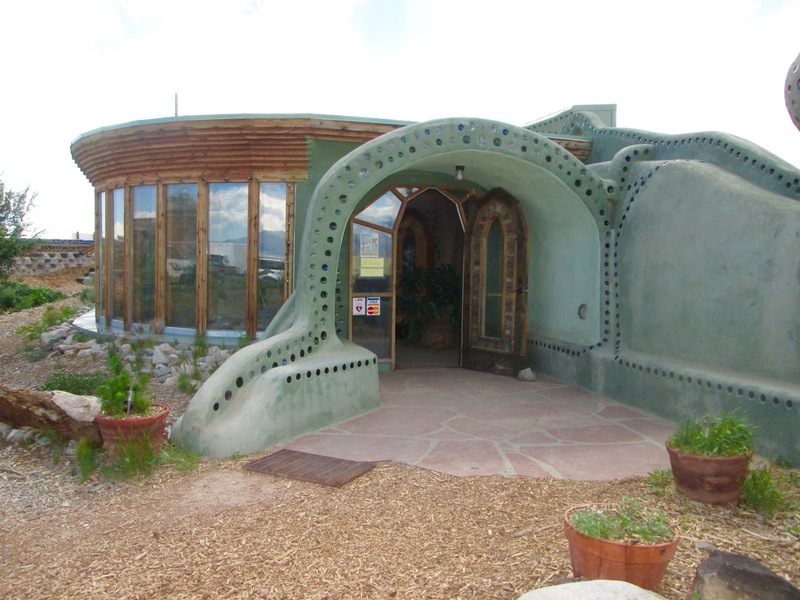 A few miles out of Taos we visited a small development where houses are built with recycled and renewable materials. Houses are totally off grid, solar and wind provide power. Collected rain water, snow melt and condensation provide water. It was fascinating. I admire people who live with such attention to taking care of mother earth. I need to do better, even small things can make a difference. Model home/Earth Ship's office. 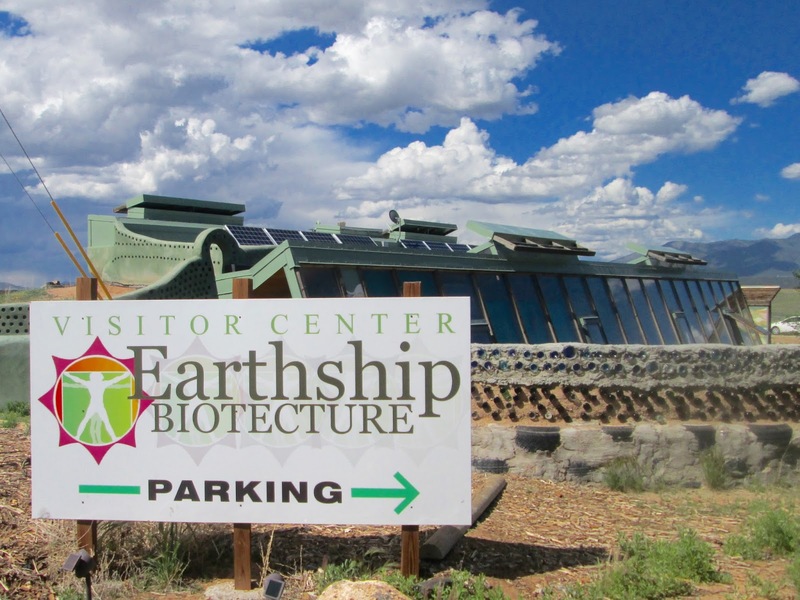 Seminars are held at this location, attendees are university students and people wanting to learn how to build an Earth Ship house. They claim anybody can learn to build one of these amazing houses and can be built in any part of the country. 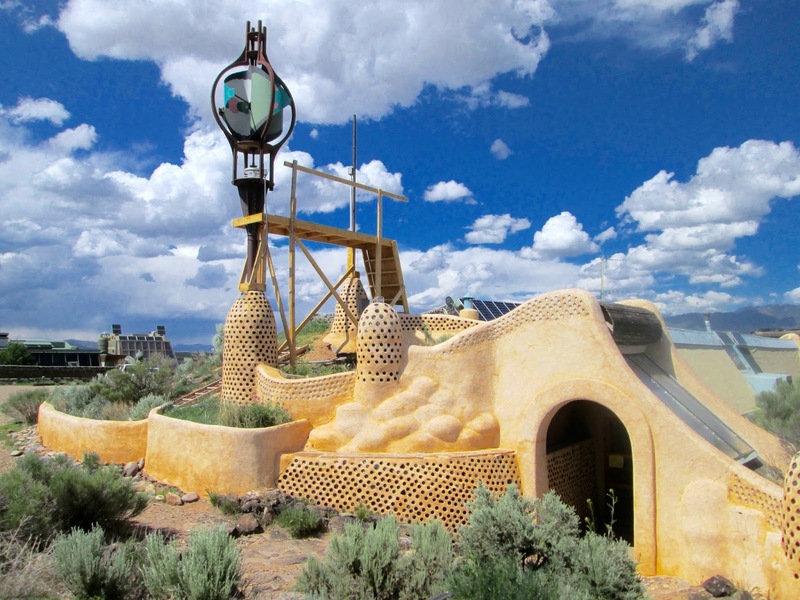 (One is currently being built in Williams AZ, about 30 miles from Flagstaff.) We were able to tour this house, there was signage and a video explaining more about the Earth Ships. We could also see the many systems in operation. It looked complicated but they claim not so much once learned. Since the house is built into the ground we could walk on top the roof, the roof has a slant which enhances the rain collection, the water runs down the channel into the water system inside the house. All houses have a greenhouse incorporated into the floor plan used for growing food, we saw some tasty looking veggies. Gray water from sinks and showers is filtered and piped into the greenhouse. The filtered gray water is also used to flush toilets. House in the construction phase. I wanted to get a closer look but being a construction site and private property, it was understandably off limits. Looks to be a good size house, all the windows to the south will give it tons of passive solar power. Behind this house in the distance are more Earth Ship houses. Again, it's private property and not really a tourist drive. Although at the office they have a listing of one for sale, they also have one house that can be rented for a weekend stay. This interesting building is in the same area as the office, it's used for seminars and meetings. The decorative gizmo on top is actually a wind turbine for generating electricity. Interesting wall by the office house. The old tires on the bottom are filled with dirt pounded in with huge sledge hammers (by hand), referred to as rammed earth. This provides a good support base as well as a thick wall for insulation. The rammed earth tires are used as the foundation in the houses then covered with an adobe type mud. What a great way to use old tires. Old bottles are often incorporated as a decorative feature. There were so many innovative ideas used in these houses. 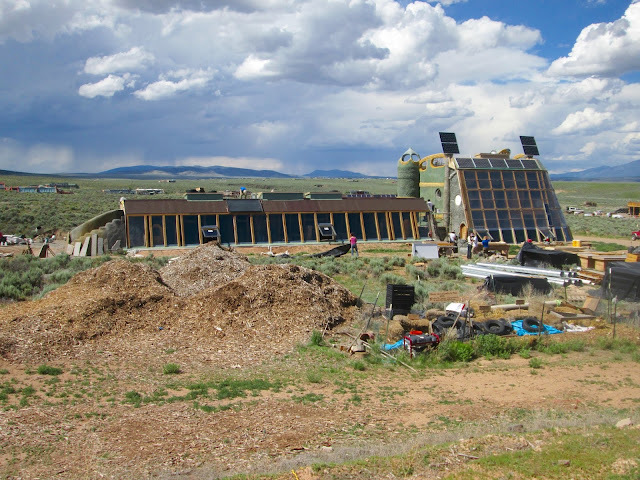 If you're interested in reading more, check out their website, Earthship.com. 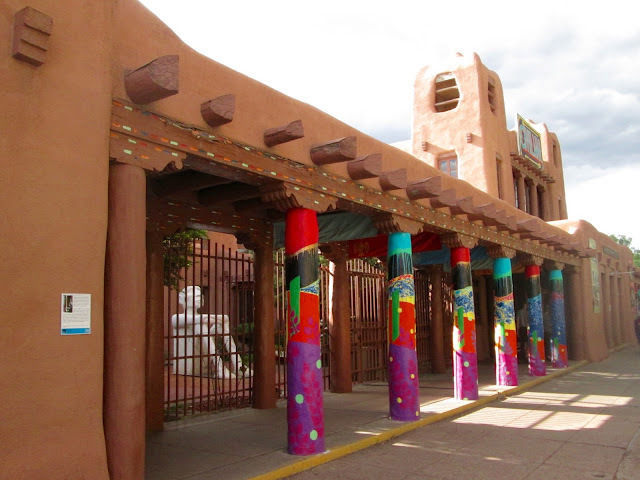 Santa Fe is a very beautiful city, rich in history, adobe style buildings, very colorful and clean. We spent two evenings just walking around. Celebrated our anniversary here. 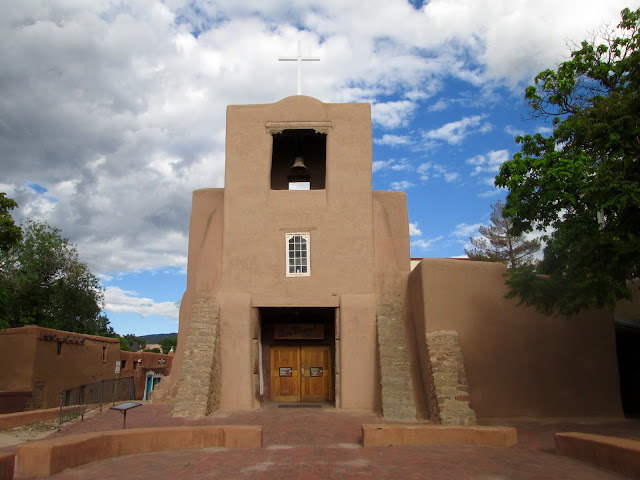 San Miguel Mission, claims to be the oldest church in the U.S. Built by Tlaxcalan Indians from Mexico in the early 1600's. I liked the bird sitting on top the cross. 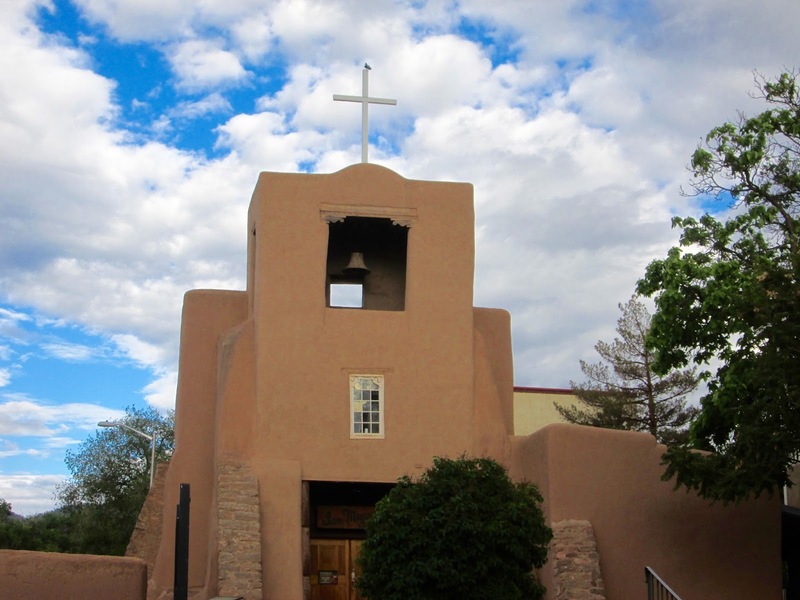 Regular church services are still held at San Miguel. St Francis Cathedral, downtown by the historic Santa Fe Plaza. 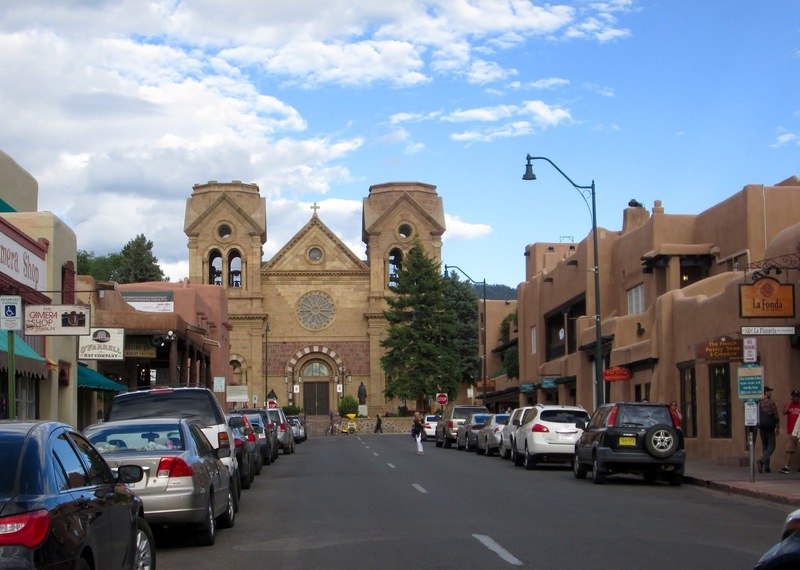 Plazas date back to the town's beginnings, originally and still a center gathering place. The old missions are so beautiful. 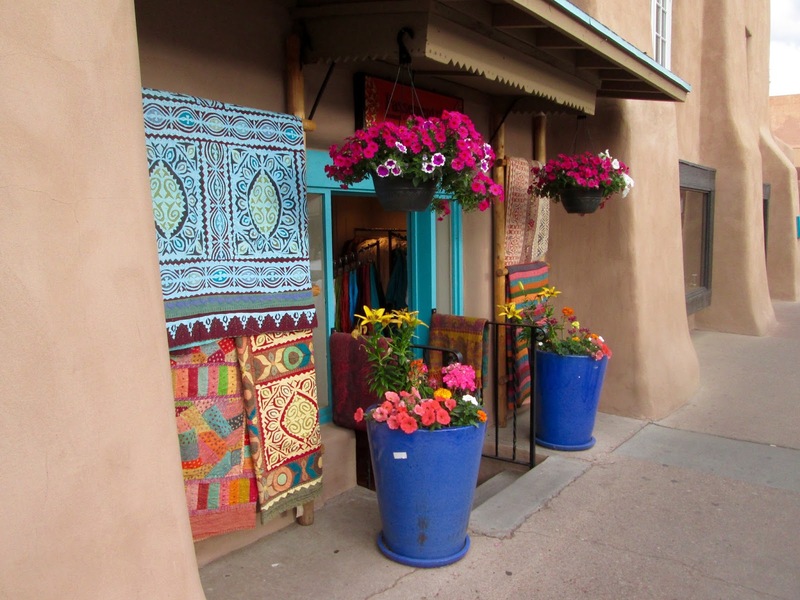 Colorful shops and restaurants abound. If you like to hike, this is a good one! 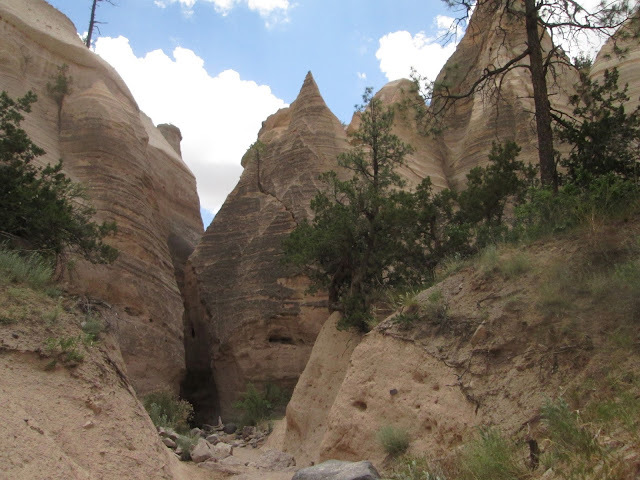 Kasha-Katuwe Tent Rocks National Monument, about 40 miles south of Santa Fe. 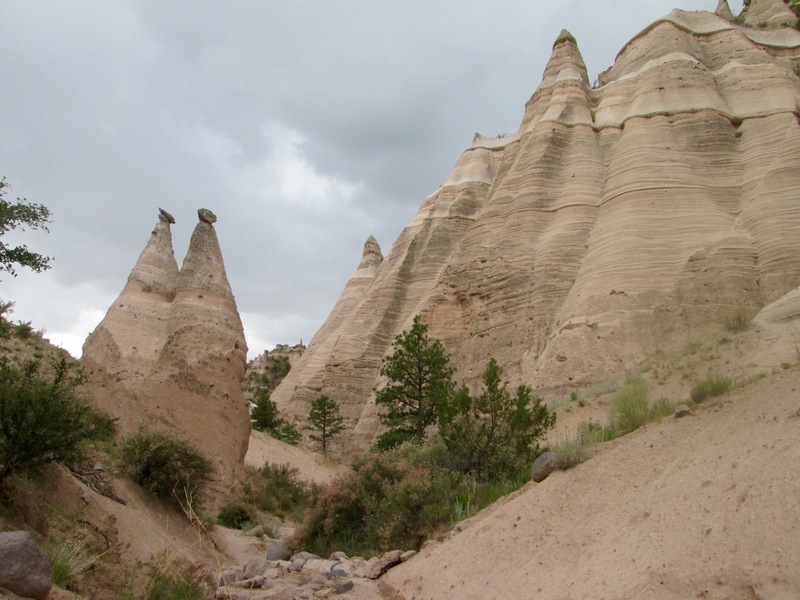 The tent shaped rocks, also known as hoodoos, are the result of volcanic activity millions of years ago. 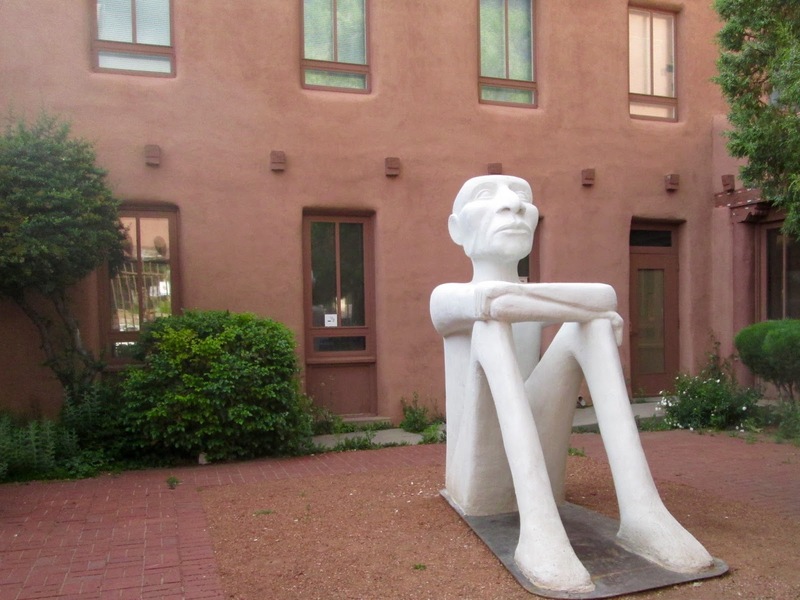 This national monument is a scared site to the Cochiti Pueblo Indians. The hike was a 3 mile in and out. 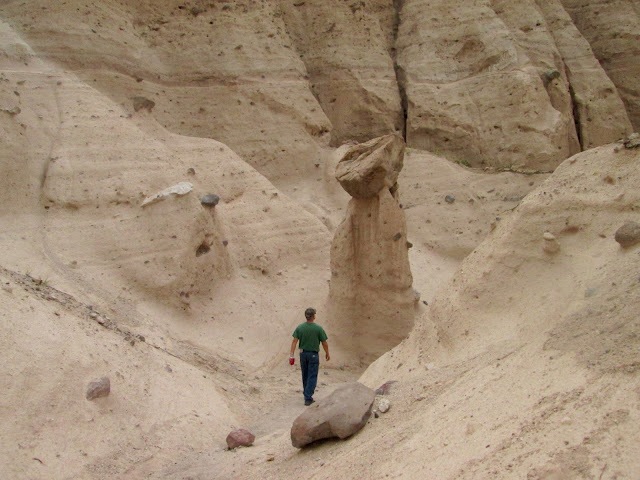 At times it looked like another planet. Storm moving in, we got sprinkled on towards the end. We don't mind the rain but we've seen some intense lightening out here and don't care to get caught on a mountain in a thunder storm, so we picked up the pace. 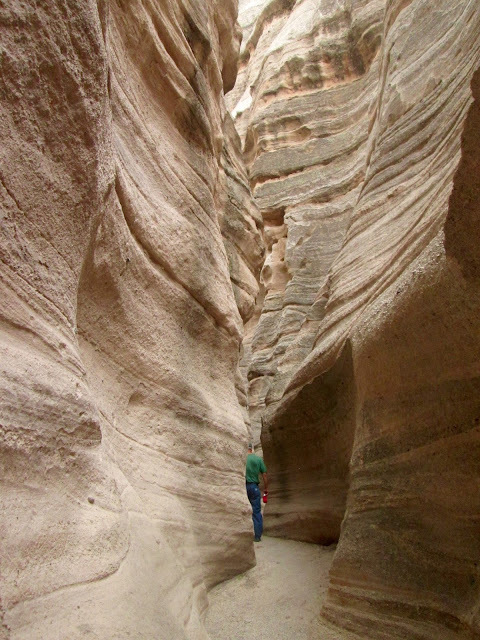 Hiking thru the slot canyon was most amazing! 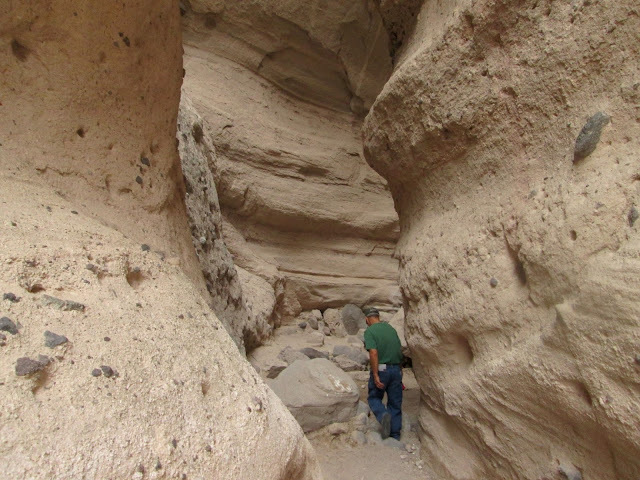 More of the slot canyon. With the storm brewing, it got very windy in here, sand started blowing around. We came across this little mission on our way to Taos. 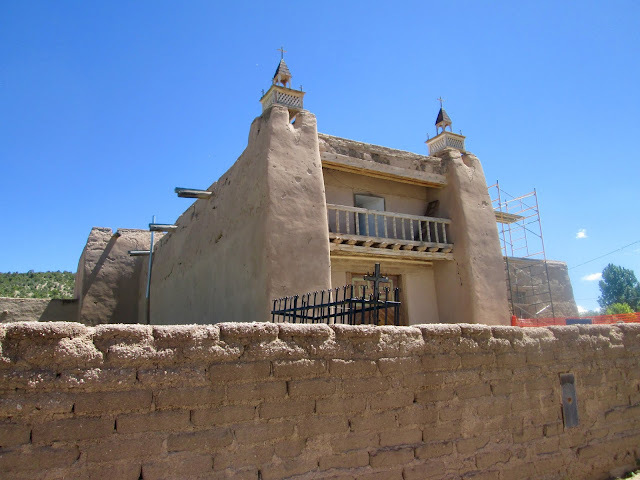 Las Trampas, a small village established as an American-Spanish settlement in 1751. 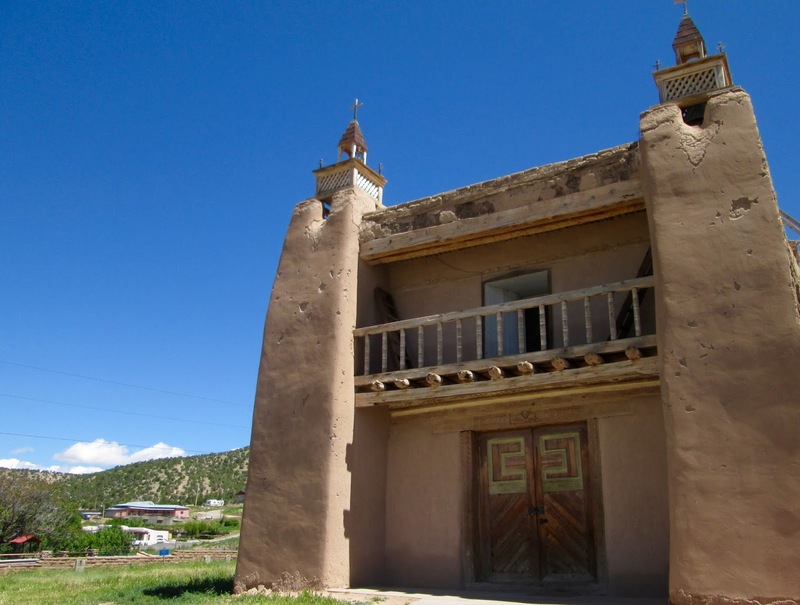 This church remains a community center where religious ceremonies are still observed. Parishioners periodically re-mud the adobe walls which are as much as 6 ft thick, see scaffolding on one side. Las Trampas is such a small little settlement, just a few scattered houses, agriculture seems to be the main source of work, we didn't see any stores, in fact we drove by this mission at first then turned arouund to check it out, glad we did. I just had to snap a picture of this RV. 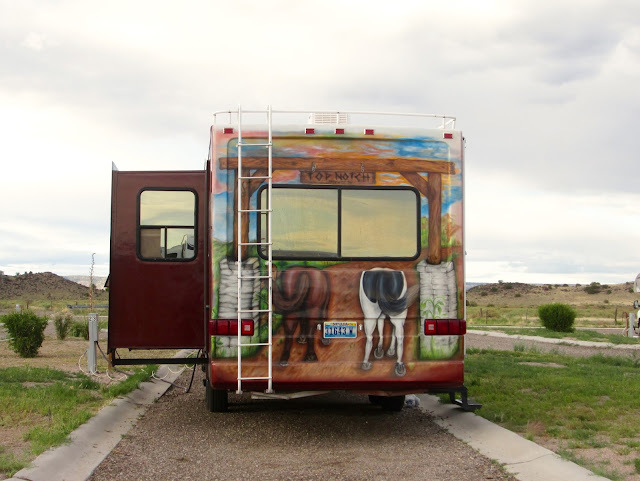 At a NM casino campground, nice pull thru sites, very reasonable, perfect for a stop over and an easy walk to the casino for a bite to eat. All for now. The RV life is treating us well. Love to our family.